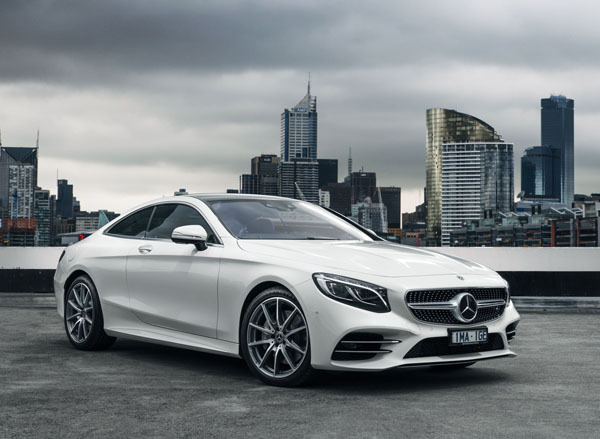 The new Mercedes-Benz S-Class Coupe and Cabriolet are now on sale in Australia. Both feature a long list of standard equipment as seen not only in the Mercedes-Benz S-Class saloon, but also from the flagship of the German prestige range, the Mercedes-Maybach S-Class. Mercedes S 560 Coupe and Cabriolet have front Active Multi-contour Seats that use inflatable chambers to provide adjustable lateral and lumbar support, including a lumbar massage function. Active lateral bolsters adjust to support occupants during cornering. High quaintly Nappa leather trim is used in both vehicles. They can also appreciate a Burmester sound system with 13 speakers and a total output of 590 watts, a digital TV tuner. Mercedes’ COMAND Online system operates through a 12.3-inch multimedia display and there is full smartphone integration. The S 560 Coupe has a fixed glass panoramic roof. Both vehicles are fitted with a new design 4.0-litre biturbo V8 with 345kW of power and 700Nm of torque that works in conjunction with a nine-speed automatic transmission. Both the S 63 Coupe and Cabriolet have the AMG Driver’s Package which lifts the governed top speed to 300 km/h, and an AMG Performance steering wheel. 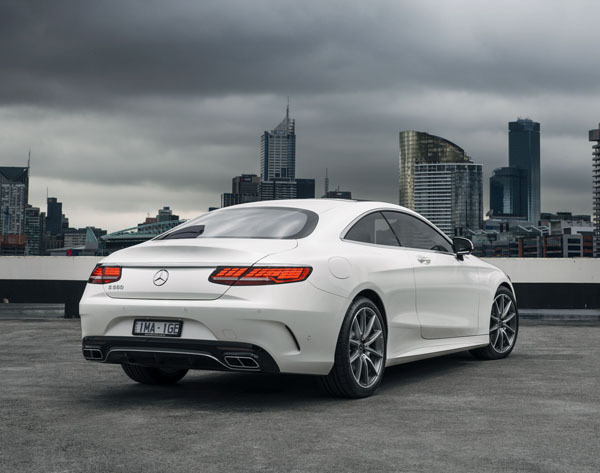 The new 4.0-litre biturbo V8 has its power and torque increased – to 450 kW and 900 Nm and drives through an AMG SPEEDSHIFT MCT nine-speed automatic. Other standard equipment includes AMG illuminated door sill panels in brushed stainless steel, 20-inch AMG 10-spoke forged wheels in titanium grey, an AMG high-performance composite braking system, an AMG sports exhaust and red brake calipers. The Mercedes-AMG S 65 Coupe and Cabriolet have a huge 6.0-litre V12 engine making 463 kW and a skyhigh 1000 Nm. It powers through an AMG SPEEDSHIFT PLUS seven-speed automatic to 20-inch AMG multi-spoke forged wheels. The S 65 Coupe also adds a panoramic fixed glass roof with MAGIC SKY CONTROL variable transparency. Its entertainment is provided by an impressive Burmester High End 3D Surround Sound System. We managed a brief test drive of an S 560 Cabriolet that was brought along by Mercedes-Benz Australia during the launch of the new Merc CLS a few weeks ago. This is a large impressively styled machine that can be either a luxurious cruiser or a full-on high-performance sports machine. Engine power is offered up all but instantaneously thanks to the new design biturbo that spools the eight pistons up at the merest suggestion of throttle movement by the driver. Handling is superb and the big Cabriolet held on in demanding bends with never a trace of getting out of control. Obviously the laws of physics will always win in the end, but believe me you should only tempt these laws during track days. Comfort is excellent in the standard setting and even if you do opt for a sporting mode it takes a lot to create any unpleasant sensations for the occupants. Note: These prices do not include government or dealer delivery charges. Contact your local Mercedes-Benz dealer for drive-away prices.